Sorry for the late start this week. This week God's fingerprints were all over the juicy red watermelon we had. 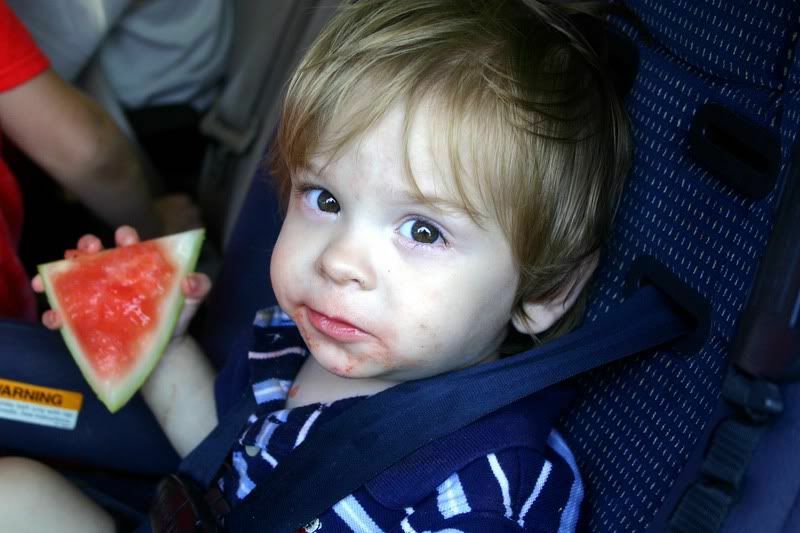 So much so that it was impossible to even go for a drive without a piece of watermelon in hand. (it was worth it to avoid the screaming fit... I'll show pictures of that later.) So thank God for the delicious sticky yummy watermelony taste of summer! Mmmm, she looks like she's certainly enjoying that juicy red watermelon! We had some at a picnic at my workplace yesterday and it was fantastic! Thank God for the joys of summer! Haha!! He's a boy. But he's a little hippy who seriously needs a haircut. Sorry about that! HE is a cutie! I missed today..Was at my granddaughters concert and couldn't get to a computer..Of course my daughters teases me about going to computer anonymous, will be back with you all next week..Love the picture with the watermelon..Kids to me are the biggest fingerprints..Moms/Dads too..
nothing beats a good watermelon on a summer day! I was going to say I liked his hair :) its cute!